I can remember making punch in an actual punch bowl, usually with sherbet or some fruit frozen into an ice ring. 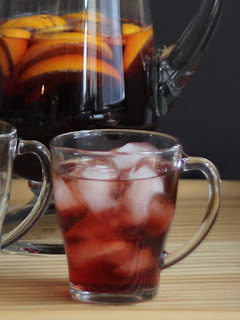 These days, I'm more likely to serve punch from a pitcher for less-messy serving. And the sherbet is gone, too, since I prefer drinks that are less sweet. This one gets its tartness from cranberry juice and its sweetness from frozen apple juice concentrate. Fizziness comes from seltzer water - or you could use club soda or tonic water, if you like them better. Combine the cranberry juice, apple concentrate, Four Roses bourbon, orange wedges, lemon slices, and cinnamon sticks in a large pitcher. Let the punch rest, refrigerated, for at least an hour before serving. Add the sparkling water just before serving, so you don't lose the fizz. Or, if you prefer, you can add the sparkling water to each glass at serving time. Serve in glasses, with ice. This post was sponsored by Four Roses bourbon.